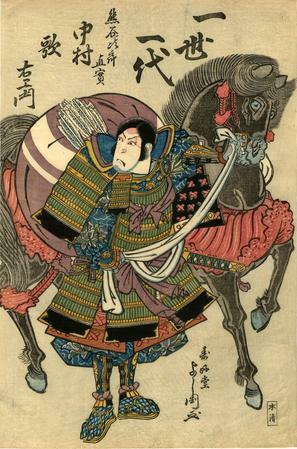 Issei ichidai (一世一代) is boldly printed above the horse's mane. It is an advertisement for the fact that this print is meant to represent Utaemon III's final performance as Kumagai Jiro Naozane. There are at least three other prints from this series with a similar inscription with Utaemon playing different roles. Nakamura Utaemon III as the armored warrior Kumagai Jiro Naozane leading his high stepping black stallion in the play Ichinotani Futaba Gunki (一谷嫩軍記) performed at Kado theater 3/1825. Illustrated in Ikeda Bunko, Kamigata yakusha-e shūsei (Collected Kamigata Actor Prints), vol. 1, Ikeda Bunko Library, Osaka 1997, no. 369.